...Berkeley Pumps & Agriculture Solar Powered Water Pump Power Increases Efficiency, Lowers Costs and Maintenance. We offer tailor-made solutions that work with you to create energy cost savings. BERKELEY Pumps and Agriculture Solar know that you demand the highest performance from your irrigation pumps and power systems. Our professionally engineered, high-quality, centrifugal pumps, subturbine pumps and line shaft turbine pumps deliver years of trouble free, efficient operation. After three quarters of a century, the BERKELEY Pumps tradition of engineering excellence and superior product is still in full force. This is evident in the quality of our irrigation pumps, pump power, and every pump BERKELEY Pumps and Agriculture Solar builds and power. At Agriculture Solar, Berkeley Pumps and Agriculture Energies can be your simple water pump solution. Since 1937, when BERKELEY pumps were first used to irrigate the fertile fields of the San Joaquin Valley of Central California, up-through today's most challenging water transfer projects, the name BERKELEY has stood for uncompromised quality and proven reliability. As BERKELEY has grown, so has its product line. Today BERKELEY leads the industry with the most comprehensive product lines available in the industry. Agriculture Energies systems have been dedicated to modern agricultural irrigation and successfully active in the top irrigation fields for over 10 years and continues to bring the tried and true principles and advantages of solar hybrid power. Think about it, and then make your move. 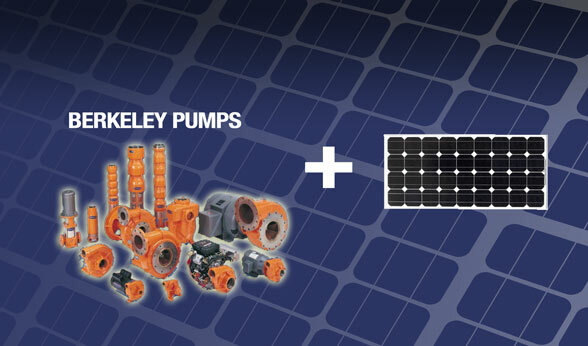 Let Berkeley Pumps and Agriculture Solar water management provide you with decades of reliability and lasting value. We invite you to explore the possibilities of our reliable hybrid solar powered pump solutions.